The murder of dissident Saudi journalist Jamal Khashoggi has fixated global media’s attention on Istanbul. It is not a coincidence that Khashoggi, who fled the pressures of his home country, settled in Istanbul. The figure of Jamal Khashoggi gives away many clues about the sociological structure of nearly two million Arabs living in Istanbul. Productive and free minds from Cairo, Damascus, Baghdad, Sana, Tripoli and Riyadh flock to Istanbul, which, like a magnet, draws these independent thinkers. Today, Istanbul deserves the title of “The capital of the Free Arab mind.” In order to shed light on why Istanbul is a hub for such minds, we spoke to various figures to understand the reasoning behind this phenomena. I visited Istanbul for 20 years for both touristic and business purposes, but I settled here in September 2014. I set up the Egyptian Research Institute here. Since 2014, the institute has operated in Istanbul with a focus on political, strategic and social issues. We thought that this city was the most suitable place for such intellectual activities in our close geography. There are many reasons for this. The main reason is that there is an atmosphere of freedom to conduct such activities in Istanbul. When it comes to the second reason… Even though our institute focuses mainly on Egypt, we also cover regional developments. Istanbul is the best place to follow these events. Syrian government forces clashed with opposition members in Hama province on Friday in some of the heaviest fighting in the country's northwest in a year, the Syrian Observatory for Human Rights said.The army and allied forces attacked the oppsoition near Halfaya village overnight, seizing some positions, the UK-based war monitoring group said.At least 22 members of the Jaish al-Izza faction died in ambushes, and dozens more were wounded, the highest casualty toll of fighters in the northwest in many months, it said.The Observatory said it was unclear if pro-government forces were killed. Today, Istanbul holds a place in the heart of everyone in the Muslim and Arab communities, because it is a city of great importance in terms of Islam’s history. Over the past 10 to 15 years, everyone has realized that Istanbul is a symbol of Turkey. It has also been noted that many different cultures live together in Istanbul. In fact, everyone wants Istanbul to become a global and Islamic hub, and many are working for this. Of course, Mecca and Medina are different, but the Muslim community has been distanced from them. The latest incident [killing of Saudi journalist Jamal Khashoggi] caused us to lose a great deal. Muslims, and especially Arabs, are thrilled by a strong Turkey. That is why once Turkey developed, everyone came here. Turkey opened its doors to everyone. Those fleeing oppression in Egypt now only think of Istanbul. Those fleeing from the troubles of Yemen and Iraq come to Istanbul. There is no need to even mention Syria. Syria’s true half is in Turkey. I say true half because since its establishment, since 1947, all the Syrian presidents have had Turkish roots. Their surnames are Turkish. Shukri al-Quwatli, Husni al-Za’im, Hashim al-Atassi, Adib Shishakli. These are Turkish names. People started coming here because Turkey does not make them feel like outsiders. Egypt defended its role as the leader until the 1950s, but lately, it has become a country that is no longer at the hands of Egyptians. Turkey, and specifically Istanbul, is now the hub. The unofficial number of Arabs in Istanbul has neared two million. We support the strategy developed by Turkey regarding the Arab population that has settled in the country over the last three to four years. The Arabs who settled here act like Turkish citizens, and feel like they’re home. They establish businesses and buy homes. Through these investments, they are declaring that they see their future in Turkey. They do not want to spark a problem or crisis for the Turkish community but rather prefer to make contributions. The Turkish Red Crescent has sent 42,000-trucks of humanitarian aid to Syria since the start of the civil war in 2011, the head of the aid group said.“The Turkish Red Crescent has sent about 42,000 trucks loaded with humanitarian aid to Syria since the beginning of the conflict by itself or in cooperation with the partners,” Kerem Kınık told reporters.“In this period, food, clothes and shelters were mainly dispatched to the region. The daily life started to normalize after the Operation Euphrates Shield and Operation Olive Branch, and the ceasefire in Idlib,” Kinik said.The Turkish Red Crescent also supports international aids to 6.5 million internally displaced people in Syria, he stated.Kinik said that nearly 25 trucks carry humanitarian aid to Syria per day.Turkish aid body helps orphans paint dreams in EthiopiaThe Turkish aid body also carries out operations in other areas, including promotion of agriculture, construction of permanent residences, health and security services, the head of the aid agency said.The operations create a “positive atmosphere” in the war-torn country, Kinik said, adding:“This atmosphere has become a trigger and encouragement for those returning back to Syria from Turkey.”The organization also improves the conditions in the refugee camps, and serves civilians in healthcare.“The hospitals [established in al-Bab and Cobanbey] are ready to be operational. We are also working to supply the blood need,” Kinik said.The Turkish Red Crescent also works to prevent the civilians from the affects of a possible operation in the east of the Euphrates River, Kinik said.The aid organization operates in 45 countries including the Caribbean.In 2017, the Turkish Red Crescent helped over 18 million people, Kinik said, adding that it will have reached almost 30 million people by the end of this year. The answer to why Arab intelligentsia prefers Istanbul is quite simple. Because Turks prefer Istanbul too. We are talking about a city that hosts nearly one quarter of Turkey’s population. In every aspect, from economy, education and science, Istanbul is the heart of not only Turkey but also the region. I find it rather natural for Arabs, who are not at ease in their own countries, to prefer Istanbul. In which other city can a well-educated Arab find a suitable job matching their qualifications? Let me give myself an example. As a nuclear physics expert, I lived in Iskenderun, Mersin and Adana for a while before I came to Istanbul. But I couldn't find a job appropriate for my qualifications. Therefore, I had to settle in Istanbul. This is actually a great opportunity for Turkey. I think that having such a qualified Arab population in the same city makes it very easy to mobilize. This needs to be put to good use. The Turkish government has an opportunity in terms of the relationship between the Turkish and Arab communities. 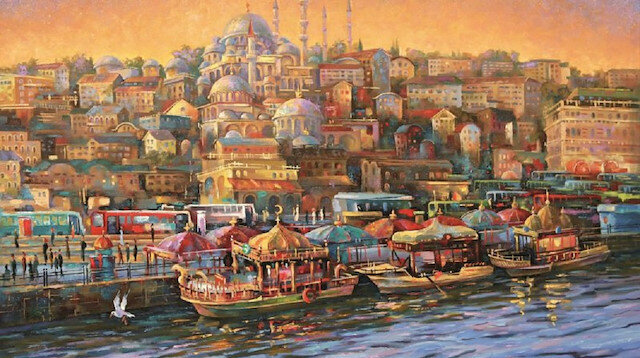 Many of the leading businessmen of the Arab world, important scientists, politicians and figures of the art world now live in Istanbul. You need to think about the synergy that they deliver. If these people are given the necessary standing and channeled correctly, an incredible power will be captured. Another important matter is that the laziness in terms of language of both Arabs and Turks must be overcome. Language poses the greatest barrier in terms of the integration of both communities. Arabs must be more determined to learn Turkish. Istanbul is a safe city that embraces everyone who wants to feel free. Someone from any Arab country can make whatever art they like here, manage whatever scientific project they want and trade as they please. Just like during the times of the Ottoman Empire, Istanbul has become the capital of Arab culture and Islamic civilization. Turkey overall, and Istanbul in particular, has offered us the same opportunities it presents to its own people. I think a year spent here is equivalent to five years of progress. We are talking about a global city open to change and progress. There's a great interaction here. Approximately 10,000 Turks learn Arabic every year. The first reason for this is because there are many Arabs in Istanbul. I think the second reason is because the government has a warm stance toward Arabs and the Arab world. As an educator, I can say that I am very pleased with the interest of Turkish youth in Arabic. In the next decade, I think that the number of Turks who speak Arabic will rise significantly. This situation will affect Turkey in a positive sense, and I believe that this will deepen the country’s position as regional leader. Officials of various international organizations working with migrants and refugees discussed Syrian refugees in a workshop organized on Wednesday in Turkey’s capital Ankara.Entitled “Global compact on refugees” and the future of Syrian refugees, the workshop was organized by TOBB University of Economics and Technology as part of a joint seminar in cooperation with the Japanese Embassy in Ankara.The workshop consisted of two sittings with speakers, including EU Ambassador to Ankara Christian Berger, Miyuki Konnai of the Japanese International Cooperation Agency and Kemal Kirisci of the Brookings Institution in Washington.Stressing that the issue of migration had become a “global challenge that needs a global solution”, Christian Berger emphasized the need for cooperation among all states involved with refugee movement, including host, transit and countries of their origin.He underlined that the priorities of the international community should be the integration of migrants in their host societies through education and legal workforce participation as well as the elimination of the circumstances that initially forced refugees to flee their home countries.Kirisci also stressed that humanitarian aid for Syrian refugees could not “take the place of” political solutions and the facilitation of their return to Syria.He added that while refugees working in the formal sector bolstered the economies of their respective hosts, a “degree of safety” was necessary in order for refugees to return voluntarily to their home countries.Konnai spoke on the cooperation between Ankara and Tokyo on Syrian refugees in Turkey that include development assistance for infrastructure as well as training and psychosocial care for refugees.The findings and speeches of the workshop will be published, with a goal to share best practices regarding refugees and migration. The United Nations has finished distribution of aid to thousands of Syrians, mostly women and children, stranded in the desert close to the border with Jordan, an aid official said on Wednesday.A U.N-led convoy of more than 70 trucks arrived on Saturday under Russian army protection after months of delay in the first such first aid delivery from inside Syria to the rebel-held camp that has over 50,000 people. "We finished distribution of all items, food, sanitation and hygiene supplies and core relief items," Fadwa AbedRabou Baroud, a U.N official with the convoy told reporters. "The overall humanitarian situation in Rukban camp remains dire, with shortages of basic commodities, protection concerns, and the death of several children who reportedly were unable to get medical treatment," Baroud said.The assistance would only provide short respite and without regular and uninterrupted access, the plight of desperate residents in harshest desert conditions would only further deteriorate as winter cold sets in, the U.N official added.Video: UN aid trucks reach remote Rukban camp in SyriaThe U.N. team will complete a vaccination campaign against measles, polio and other diseases to protect some 10,000 vulnerable children in the camp before it departs, Baroud said. The U.S. State Department welcomed the aid to the camp, located close to the Tanf U.S. military base in the desert near where the borders of Syria, Jordan and Iraq converge.Washington said it hoped Moscow would continue to put pressure on the Syrian government to comply with U.N. resolutions on allowing humanitarian access across frontlines.The camp was last month besieged on the Syrian side of the border by the Syrian army, preventing smugglers and traders from delivering food.